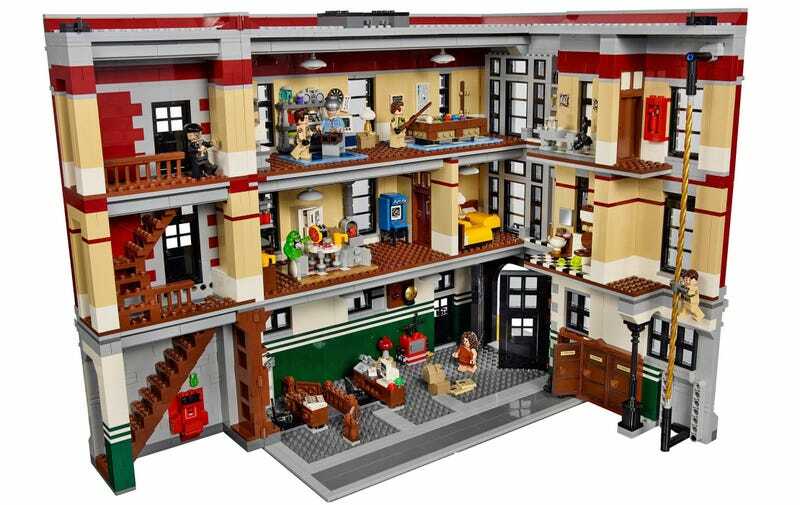 You can’t actually buy it until the new year, but on its Facebook page today Lego revealed a giant gallery of images of what you’ll find inside its new Ghostbusters Firehouse Headquarters set, and fans of the movies are going to be blown away. The set is already almost perfect when standing there all closed up. But one side of the firehouse opens like a book to reveal all of the countless details and nods to the movies hidden inside. Remember the toaster dancing on the pool table scene from Ghostbusters 2 after it was slathered in mood slime? That’s included, although you’ll have to provide the Jackie Wilson soundtrack yourself. And Egon experimenting on Louis Tully after he was possessed by Gozer and became the Keymaster? That’s here too, complete with the ridiculous helmet and lab full of questionable scientific equipment. The new Minifigs included with the set are equally wonderful. Who’d have thought that Lego could have so perfectly captured Rick Moranis’ Louis Tully’s idiotic facial expressions in a tiny plastic figure? And Annie Pott’s Janine Melnitz’s glasses halfway down her nose? Perfect, just perfect.